Combine the vinegar and the 1/4 teaspoon salt in a small bowl. Whisk in the olive oil and pepper. 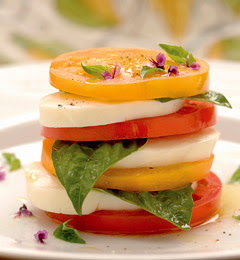 On each of 4 salad plates, create a tower of the mozzarella, tomatoes, and basil, starting with a tomato slice, followed by a mozzarella slice and 2 basil leaves. Repeat, finishing with basil leaves. Spoon 1 tablespoon of the vinaigrette over each tower and another tablespoon around each tower. Sprinkle a pinch of sea salt on each salad and serve at room temperature. This is my favorite summer salad. Panera has a decent version with yummy flatbread!